Mentioned is the way you can write Waiter CV Template. 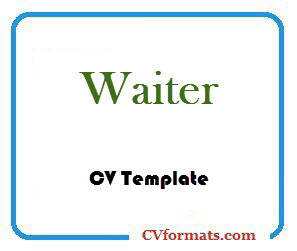 People looking for jobs can easily download these Waiter CV formats in editable pdf and MS-Word (.doc) formats or you can just copy and paste from or website CVFormats.com and app. Cover letter of Waiter CV Template is also available. Just change the name , address , qualification and experience and your Waiter CV Template is ready. Career Objective: To work my way up to the top positions in the restaurant industry. 2016-Present, Big Kahuna Burgers: currently employed as a Waiter, responsible for everything from seating to taking orders to cleaning up. I am also expected to wait until after the last customers have left before cleaning up and retiring myself. I participated in a local food convention and was awarded the right to represent Big Kahuna Burgers for the same.